One of the most anticipated releases, that is still not on a confirmed release footing, is the Super Audio CD (SACD) of Wish You Were Here. This has been promised for some time, and indeed, in Storm Thorgerson's latest edition of Mind Over Matter, he showcases the artwork for the release which he states "is due in February 2008", which clearly didn't happen! In an interview with David Gilmour published in September 2008 he confirmed that work was still ongoing on the release, and this is the latest information we have on this. As and when we hear anything else, we will update this page. Mobile Fidelity Sound Lab has obtained the master tapes of this landmark album and for the first time What’s Going On will be released on the Super Audio CD format which has a high resolution layer and a CD layer. As with all Mobile Fidelity Sound Lab releases, meticulous attention to detail is paid during the transfer process. Marvin Gaye’s What’s Going On was a landmark recording and is considered one of the greatest albums ever made. Rolling Stone named it Album of the Year when it came out and in 2003 it was ranked number 6, the highest for a non-rock album, in Rolling Stone’s 500 Greatest Albums Of All Time. Originally, the title cut was recorded as a single, and Motown chief Berry Gordy refused to release it, citing that it was too personal and political. "What's Going On" became Motown's fastest-selling single at that point, going to the number one spot on the R&B charts for five weeks and number two for three weeks on the Pop listings, which lead Gordy to request a full albums' worth of material. “What's Going On”, the single, was recorded in June of 1970. The remainder of the album was recorded in March-May of 1971 and was released on May 21st of that year. It was produced entirely by Marvin Gaye. Built around three members of the original British blues band Savoy Brown, it only took a few years for Foghat to make their bones. Signed to one of the coolest indie labels at the time, Bearsville, they hit pay-dirt with the 1975 release of Fool For The City. The highlight is the perennial “Slow Ride”, which has become (almost automatically) associated with nostalgic remembrances ranging from That 70's Show and Dazed and Confused to approximately a gazillion 70's music compilations (our fave: Mullets Rock!). The band's infectious hook-laden blues-rock hybridity is no better served than on a rousing, very Zep-like electric take of Robert Johnson's Terraplane Blues. Hold your lighters high and proud. This highly anticipated release is the third in the series and presents the Gabriel years remastered in multichannel for sacd. 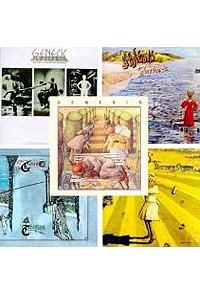 It includes the albums, "The Lamb Lies Down on Broadway", "Nursery Cryme", "Foxtrot", "Trespass" and "Selling England By The Pound". It has been delayed until November the 10th but can be pre-ordered today..
PLUS THE LAMB SHOW SLIDES!! The analog masters for Bossanova have been missing for 18 years and were located recently in the WEA tape archives in L.A. This will be the first time the original 1/2" analog master tapes were used since Bossanova's original release in 1990. Released on August 13, 1990, Bossanova was the Pixies' 3rd release and was their second time collaborating with independent English producer Gil Norton. The album departed from the "unpredictable" signature sound of the Pixies and is considered their first anthemic project. All the original songwriting on Bossanova is by leader Black Francis (Frank Thompson), who ultimately reveals his twisted interpretation of surf music combined with his fascination of aliens and UFOs. The end result is Bossanova, often described as a surf-space rock album that touched upon new heights for the Pixies. This Super Audio disc set is a Stereo SACD, Multichannel SACD and contains a CD layer which allows the SACD to be played on any CD player or DVD player with SACD capability. PREORDER NOW! SHIPPING APRIL 2007! Originally titled "Gigantic", this 1988 release was the Boston quartet's first full-length recording. It established the Pixies almost instantly as an exciting and essential band on the national indie scene and a distinct place in the history of Punk. Producer/Engineer Steve Albini created both a compulsive and hypnotic 'in your face' rush in the economy of each song, while still retaining the band's cryptic quirkiness.The late Kurt Cobain frequently cited Surfer Rosa as one of his major musical influences. Surfer Rosa is being re-mastered by Mobile Fidelity Sound Lab from recently discovered, first-generation analog original master tapes. Marc Cohn (born July 5, 1959 in Cleveland, Ohio) is a sophisticated singer-songwriter, famous for his song "Walking in Memphis" from his self titled debut. The album is masterfully produced and features brilliantly crafted musical arrangements that perfectly accentuate Marc's soulful, rich baritone timbre and graceful, contemplative piano performances - all tastefully brought to full and exceptional sonic fruition via the Mobile Fidelity Sound Lab proprietary G.A.I.N. (Greater Ambient Information Network) 2™ mastering process. Songwritng styles vary from the Memphis/Elvis/Graceland mythic imagery of the hit single to the seemingly Springsteen inspired writing of "Silver Thunderbird". PREORDER NOW! SHIPPING MAY 2007! Discovered by Dizzy Gillespie (whose 40's rhythm section left to form the initial line-up of the esteemed Modern Jazz Quartet) , Milt "Bags" Jackson was a preeminent vibes virtuoso and enjoyed over forty years as one-fourth of the MJQ. Jackson also enjoyed decades of solo work for great jazz labels such as Savoy, Riverside and Atlantic and one of his crowning achievements occurred over a three day session booked for Riverside in 1962. Answering his 'invitation' were fellow all-stars Kenny Dorham, Jimmy Heath, Ron Carter and Tommy Flanagan. The trumpet / tenor tandem uniquely augment Jackson's vibraphone, creating a driving, free-wheeling, classic blowing session. Editor's note...borrowed from Pro-sound news....yeah yeah...I'll put it back after you've all read it..
High Wycombe, UK (March 12, 2007)--Nick Davis has spent nearly three years re-mastering the entire Genesis back catalogue in 5.1. Davis wanted to keep the type of processing used on the project in line with the style of the original recordings, so he didn't bring in too much digital processing, choosing instead a host of analog gear including a Focusrite ISA215 EQ. He also used Focusrite's Liquid Mix toward the end of the mix process. On the Focusrite ISA215 EQ, Davis commented, "It's fantastic, I really like it. I also did an album with Will Topley from The Blessing and recorded all of his vocals through a Voicemaster Pro. It's very good I was really impressed with that as well." The Liquid Mix, meanwhile, helped in some of the more unusual areas of the project. "I used the Liquid Mix for some rarity stuff and bootleg material that came in from various sources around the world. One of them was this interview Genesis did for an American chat show in the 70s and the sound on it was terrible so I used the Liquid Mix to EQ and compress that for the DVD. I do like having so many compressors and EQs on hand to switch between, and I love the fact that the processing is on board. It is a big selling point that the box doesn't drain your computer processing power." Davis started his career as a tape op back in 1983, recording early demos with Tears For Fears for Polygram. He moved to Air Studios and then Westside where he became chief engineer. After going freelance he engineered Mike And The Mechanics' The Living Years LP, which was the start of a long relationship with Genesis. "I've just kind of stayed within the family," he said. "Once they find people they like to work with they stick with them. I've done some of their live albums and produced a couple of their later albums. They decided to remix the catalogue in 5.1 and it's been a fantastic project albeit one that's been almost three years in the making!" "Various members have been more or less involved," Davis continued. "Tony Banks very much so. He's come in and heard every mix and helped me finish them off. Mike [Rutherford] has heard about 20-30 percent. Steve Hackett has been very good on the stuff he's on and Peter Gabriel has been very good too. Phil [Collins] has probably been the least involved and has just let us get on with it. He trusts us not to screw it up!" On his surround mixing philosophy, Davis shares, "I try and avoid doing anything gimmicky. It's great with Genesis because they have these big moments and you can just get a load of stuff out of all the speakers but I generally don't like stuff flying around too much. For example I would usually have the drums at the front or half way but never all the way behind you. The other thing with 5.1 is if you spread it too much you actually lose the power. It's a bit like people saying mono sounds more powerful than stereo because with mono it's concentrated in one area. So if you start spreading it too much in 5.1 you sometimes lose the power because it's the way that it sticks together that makes it sound so powerful." And, on how the mixes turned out, Davis adds, "It is fantastic. I know I would say that as I'm working on it, but I've just been listening back to And Then There Were Three. It's not my favorite album but it does sound fantastic. Some of the big moments are very exciting."